I was happy when I heard Pierce Brown would be writing a new book in the Red Rising universe, but I didn’t know it was literally with most of the same characters. And it was disappointing. 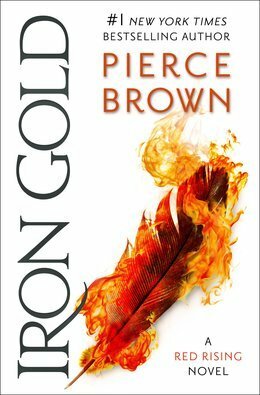 I give Iron Gold by Pierce Brown three out of five hearts because it was a disappointing read and my hype for this series got really crushed. I don’t know if it had anything to do with the rush that I was on just before I started reading Iron Gold, but I really didn’t like where the characters had gone with their life’s and the story never caught me. Mustang was a completely different woman than she was in the first three books in the Red Rising Saga. I felt so sad about this. I looked up to her and I didn’t recognise her anymore. Darrow still a little bit himself, but he was complaining and confusing his tiredness for age instead of what it really is. He annoyed the crap out of me the entire novel, even though he was okay during the other three books. How can you make such a mistake, Pierce? I felt that Darrow and the other characters were sad pale shadow of their earlier selves. Overall I didn’t care for the story in Iron Gold and it made me glad I listened to the audiobook and hadn’t pre-ordered it. Over the next year I am going to figure out whether I am going to read the next book in this series. I thought the series was great until this book. Pierce should have stopped after the Red Rising trilogy and found something new. This entry was posted in Book Review and tagged Adventure, Book Review, Fantasy, Pierce Brown, Romance, Science-Fiction. Bookmark the permalink.